[CONT] Your other character in the middle position of the center stage gets the following ability. "[CONT] This card cannot be chosen by your opponent's effects." [ACT] [(1) Put the top card of your deck into your clock & [REST] this card] Search your deck for up to one character with "Shirou(士郎)" or "Saber(セイバー)" in its card name, reveal it to your opponent, and put it into your hand. Shuffle your deck afterwards. [AUTO] [(1)] When this card attacks, if a card named "Anger Towards Evil" is in your climax area, you may pay the cost. If you do, until end of turn, this card gets +2000 power and the following ability. "[AUTO] When this card's battle opponent becomes [REVERSE], search your deck for up to one <<Master>> or <<Servant>> character, reveal it to your opponent, and put it into your hand. Shuffle your deck afterwards." [CONT] All of your other <<Master>> characters get "[AUTO] Encore [Put the top card of your deck into your clock]". [AUTO] [(2)] When this card is placed on the stage from your hand, you may pay the cost. If you do, search your deck for up to one ""Saber's Master" Shirou", reveal it to your opponent, and put it into your hand. Shuffle your deck afterwards. [AUTO] When this card attacks, if you have another <<Master>> or <<Servant>> character, this card gets +1500 power until end of turn. [AUTO] Encore [Put the top card of your deck into your clock] （When this card is put into your waiting room from the stage, you may pay the cost. 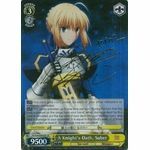 If you do, return this card to its previous stage position as [REST]) [AUTO] Resonate [Reveal a card named ""Heroic Spirit" Saber" in your hand] At the beginning of your climax phase, you may pay the cost. If you do, this card gets +1 soul until end of turn. [CONT] If you have another character with "Saber(セイバー)" in its card name, this card gets +500 power and "[AUTO] Encore [Put a character from your hand into your waiting room]". [AUTO] Resonate [Reveal a card named ""Heroic Spirit" Saber" in your hand] At the beginning of your climax phase, you may pay the cost. If you do, until end of turn, this card gets +2500 power and the following ability. "[AUTO] When this card's battle opponent becomes [REVERSE], put that character into your opponent's stock."